HIGH DEFINITION AUDIO: TWS adopts binaural design and omnidirectional microphone technology, breaking the traditional single-ear cmonication mode, realizing bi-directional communication. Besides, it with advanced noise reduction technology to diminish background sound and provide a superior listening experience, so people can hear you clearly when they are supposed to. STABLE, FAST, EASY PAIRING: Never worry about walking away or losing your connection again. 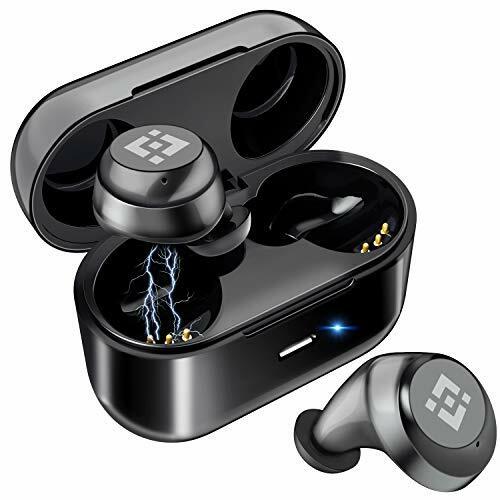 Bluetooth headset ear buds INSTANTLY PAIR with ANY Bluetooth device in seconds then STAYS CONNECTED, providing CALLS and CHATS with SIRI – crisp, clear, unrivaled sound quality. COMFORTABLE FIT: wont slip or chaff – Perfect for your active lifestyle : sweat proof Bluetooth earbuds with mic and earhook caps tuck snugly and comfortably into your ear, without chaffing, slipping or sliding around through ALL your workouts – you can run, cycle, hike, swim and stay active in complete comfort.